105 Denison Ia Sept. 13. 1879. Members and friends of the Blue Ribbon club met at the court house in regular communication on Saturday evening Sept. 13. 1879. 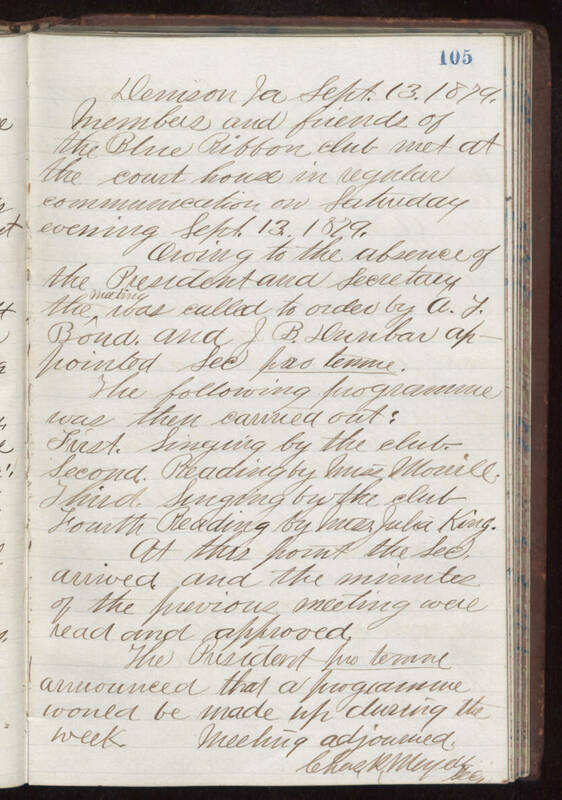 Owing to the absence of the President and Secretary, the meeting was called to order by A. J. Bond and J. B. Dunbar ap- pointed Sec. pro temme. The following programme was then carried out: First. Singing by the club. Second. Reading by Miss Mowill. Third. Singing by the club Fourth. Reading by Miss Julia King. At this point the Sec. arrived and the minutes of the previous meeting were read and approved. The President pro temme announced that a programme would be made up during the week. Meeting adjourned. [illegible] Sec.